August 16, 2011 by Venky. That was the internal dialog I failed to silence last Sunday when I was riding to Nandi and climbing it with Abhijit. Most days I manage to silence the inner bozo and get on with it. But not that day. I had to stop 25mins into the climb. Took a two minute breather and made it to the top where Abhijit was waiting having managed his personal best for the climb at 36mins and a few seconds. We had a great ride together heading home as well. But, the Bulldog was not happy with the way I did on the climb. So, I wanted to start the long weekend with a Nandi ride to take care of the unfinished business from last week. A non-stop climb. Although I did it a couple of times in the past, the latest failure was fresh on my mind. I started a bit early and rode alone at a relaxed pace to reach the base by 7am. By that time Ameet Bhide was there with his better half, Priya and another couple from their community who are also going to participate in this year’s TFN. Ameet and I began the climb together at a relaxed pace chatting along and I took a few snaps as I climbed. The weather was beautiful and we could see the top of Nandi covered in mist. The only aim was to complete the climb non-stop so I was in no hurry and so was Ameet. 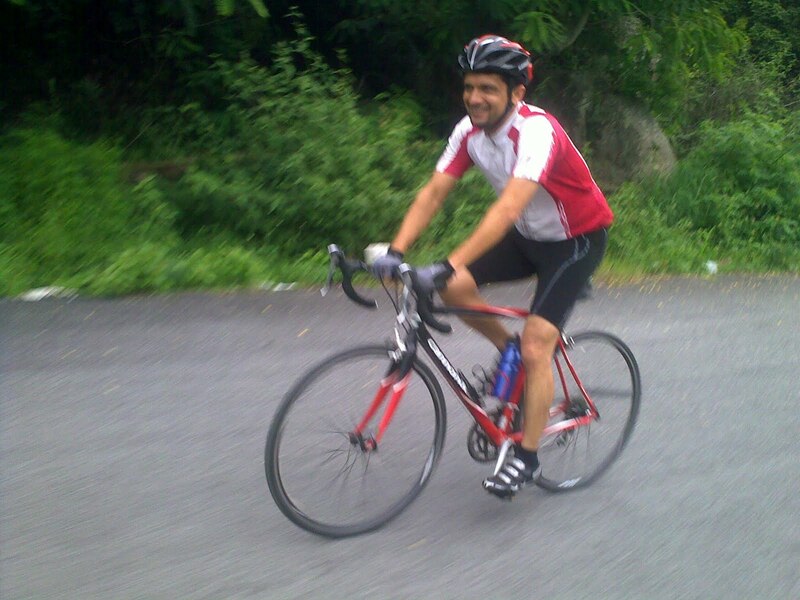 As we approached the steep section of the last 2 kms however, Ameet slowly pulled ahead. I didn’t try pushing to hang on to his wheel as I was not sure if I could. I slowly pushed ahead one pedal stroke at a time. As I approached the point where I stopped the week before, I remembered very clearly the feeling I had when I gave up last time. I consciously shook it off by getting out of the saddle and charging ahead of that section. I slowly inched ahead one curve after the other and as I approached the last bend I could hardly see the arch with all the mist. Ameet and his friend Abhilesh were already there having completed the climb in 36 mins and a few seconds. I saw 37:37 when I hit the lap button on my Garmin . It is 12 seconds less than my previous PB and also at a lesser(by 4bpm) average heart rate. It was satisfying. I think, climbing as with most things can be done better with a clear and uncluttered mind. If you think too much it can only hinder you. When you are in extreme pain, the mind, like a good steward that it is, will find excuses to get you out of that situation and try to preserve you. With the Bulldog at the top of Nandi..
Stats: 119 km in 5hrs 10 mins. Back home by 10:30 am. 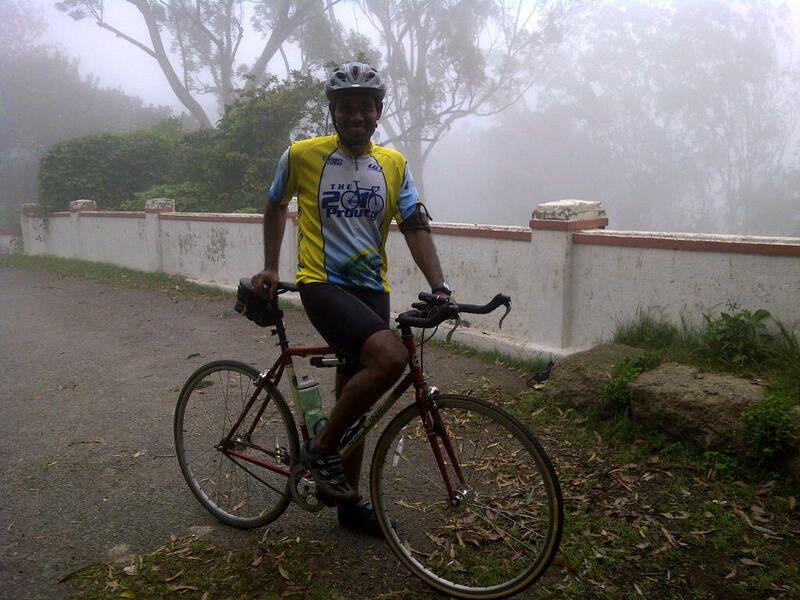 After a satisfying Nandi ride on Saturday, I wanted to do another long ride on Sunday. The Savandurga road ride that I did a couple of months back with Vineeth came to mind. 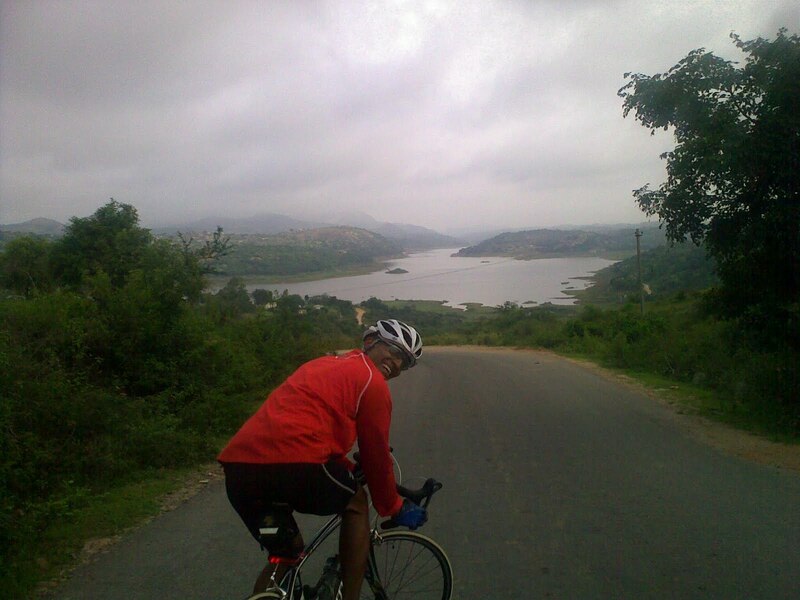 The beauty of that amazing rolling terrain made it my favorite road ride around Bangalore. I was itching to repeat it and pinged Vineeth. He was up for it and as I wanted to be back home by 11:30 am, we decided to start at his place at 5:30 am. That meant that I had to start at 4:30 am at mine. The weather was brilliant. The road till I reach our starting point is about 20km is nothing great to write home about. Even the initial 5km or so is pretty ordinary. But once you get past the NICE road intersection on Magadi road, the actual beauty of the route starts. The road condition is very good. After around 15 kms from the NICE road intersection on Magadi road, you would need to take left to get on to a road that takes you to Manchanabele reservoir. As you approach the reservoir just as you dive into a downhill you would witness one of the amazing sights the route has to offer. The full view of the lake with the hills around it. Vineeth on the ride.. The spectacular view of the Manchanabele reservoir in the background! Then as you cross the reservoir and go through a couple of villages, you would see a board directing you to take right to get into Savanadurga state forest. The 8kms of the route via the forest is slightly rough at places but is in pretty decent shape road-bike friendly over all. After you get out of the road through the forest, you would enter a smooth Ramnagara-Magadi road that takes you to Magadi via Savanadurga. On this road you can either go directly towards Magadi or take a diversion to climb up the Savandurga hill and descend onto the Madgadi road directly. The beauty of the route is that it is either going up or going down. It never seems to be completely flat for more than a few minutes. Get ready to fly down a few stretches and crawl your way up a few, throughout the ride. The ride through the forest with the buzzing symphony of the insect life and bird life in the trees is phenomenal along with some amazing views on offer on the route. Once you get on to the Magadi road you have excellent road conditions and you would enjoy the rolling terrain until you get back to the NICE road intersection. After that the traffic and the deteriorating road conditions will bring you back to the reality from the dream ride. 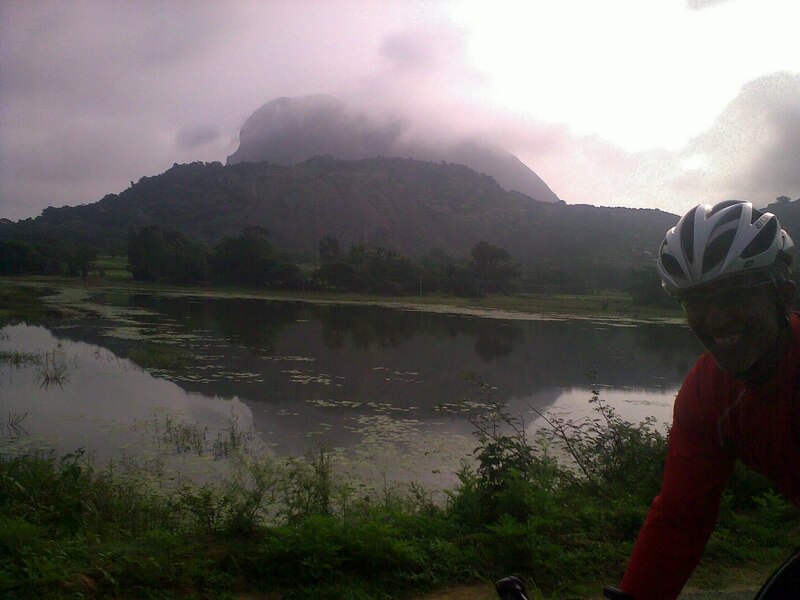 The guys at IISc Randonneurs recently rode a slight variation of the route we rode for what they called Savanadurga 100: The Monolith Populaire. Even a gpx file is available on their site for those who want to repeat this ride. I recommend this route for anyone who is looking to prepare for TFN. You will not be disappointed. I promise. Here is the gpx file from our ride. The elevation profile of the route from gpsies..
Clear skies lit splendidly by an almost full-moon, mesmerizing pre-dawn twilight with amazing symphony of the chirping birds, glorious Sun slowly making its way up trough the coconut trees and the lazy cow actively grazing on the mist bathed grass. When you get to experience all these in one ride, what else can you ask for? 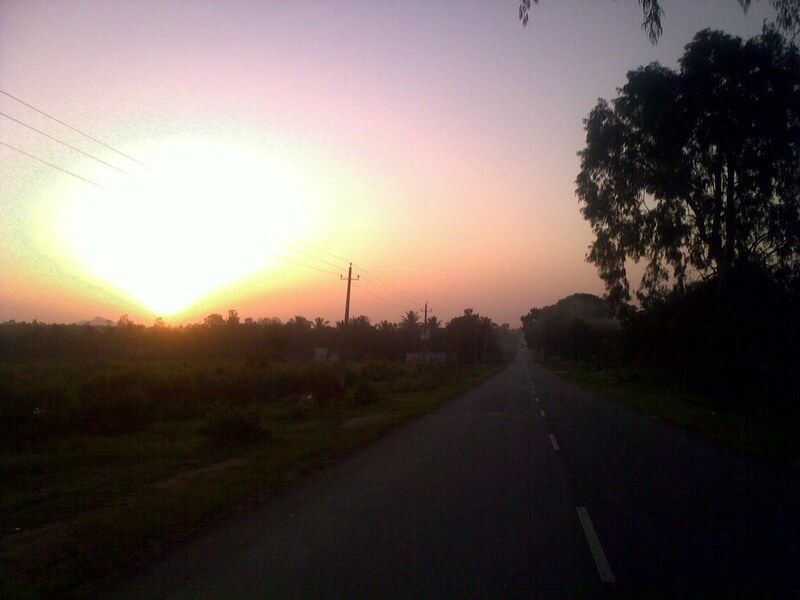 The Sunrise on Doddaballapur-Devanahalli road.. The glare on my cell camera doesn’t do justice..
That is precisely how I felt about the ride. A beautiful ride to close the long weekend. After two long rides on Saturday and Sunday with some decent climbing, I wanted to see if the legs are good for another long one. I was surprised to see how fresh the body felt even by Sunday afternoon itself. So, I promised my wife that I will be back home by 8:30 am to help her with stuff as we were having visitors for lunch that day. I wanted to complete a 100 km loop before that which meant that I had to start at least 4 hours before. So, around 4:30 am again. I ended up waking up earlier than my alarm again and started riding by 4:20 am. I made it to Hebbal and got on to the Doddaballapur road by around 5. Although I placed fresh batteries in the bike light, I found it to be not bright enough to show me potholes etc. So, I had to gingerly make my way through the unlit portions of the road. Thankfully the almost full-moon and the clear skies offered some help. It was blissful to keep looking up from time to time see the splendid moon lit sky. Around 5:30 am slowly the twilight made its way and the symphony of the chirping birds began to play from the trees on both sides. As I turned on to Devanahalli road from Doddaballapur, a huge Orange Sun began to emerge out of coconut grooves. Oh what words can describe those feelings in such settings? By 7am I entered Siva’s road from Devanahalli side. There were many riders riding on that road. Spotted Siva riding with a friend of his, saw Opendro and Ganapathy of Cleated warriors team riding as well as Akshay and Rohan from Team BOTS among the folks that I could recognize. I guess they were practicing for the Team Time Trail BBCh race that’s going to happen this Sunday. I reached home by exactly 8:30 am. It was the first time I did three back to back century rides. Granted that I didn’t really push on any of the three days, but I am still pleasantly surprised by how quickly the body seemed to have recovered after all the three rides. I guess the regular riding over the last month or so did help. Yeah GB, it would be a great ride! If you start early enough, I might join as I usually want to be back home by around 11am. 🙂 As per the Sivaganga ride, the last time when we were doing this Savanadurga ride, Vineeth and I wanted to try and go via Sivaganga as well but the roads to there seemed to be really rough for his 700*23 tires. So, we turned back and struck to the original route. But may be I will try the Sivaganga ride sometime soon.